New Zealand holiday vacation, here I come! Today was a travel day from Sydney to Auckland. Had my continental breakfast at the hotel and then found my way to the airport. Down busy Oxford Street and along the edges of the motorway. After a few kms, onto edges of motorway itself and then a few km around to the airport. Busy traffic but I'm used to it by now. My odometer read 13 km at the airport, so the Australia total is 19,491 km. Did the airport runaround to get my bike packed. To Air New Zealand who sent me to Quantas to buy a box who sent me to customer service to pick up the box...disassembled...and to Air New Zealand to check in to oversize baggage to other oversize baggage since the first was broken. Quantas boxes are wider but smaller than ones from United. This meant both wheels came off and my fender had to bend. Fortunately this also seems to make the boxes sturdier. I'll have to see if I can get such a box for India. Sent my last few Pocketmails and boarded my flight for noon. Uneventful flight, arriving in Auckland airport at 5pm including two hours time change. Here customs made an extra close inspection of my tent, but otherwise an uneventful arrival. Again it took me a bit to reassemble the bike which looked fine (except front brake which might be rubbing a bit...will have to see further). My approach to New Zealand has been very different from Australia. Prior to going to Australia, I spent at least 12 months reading, researching and looking in detail...on arrival I was eager to quickly start riding north. In contrast, I've spent little time figuring out NZ and have less of an overall route (other than getting to Wellington in four weeks, and finding interesting spot for Christmas and New Years). This started by asking at information for directions to Auckland. Bicycles are not allowed on the motorway and signs were slightly confusing so I got turned by 90 degrees, heading east instead of north. However, calm riding overall and rode mostly eastwards until I found a motel in Papatoetoe. Along the way my odometer rolled over 10,000...and right back to zero... (this from Bunbury when batteries were replaced, but the odometer was reading high and also intermittently not working). Only the second time I've "rolled" a bicycle odometer. 23 km today, 24781 km cumulative. A shorter ride around Auckland and off to the north to nice quiet town of Helensville. My two hour time change meant for a later start. The evening before I had purchased a detailed Auckland map and carefully plotted a route around the center of the city. Bicycles are not allowed on the motorways and I'd heard conflicting stories about whether cycle routes existed alongside. My route had many twists and turns that wouldn't have been possible without a map. However, overall Auckland was easier to circumnavigate than similar sized cities in the US (I can only imagine trying to go through Baton Rouge, LA or even main street Fort Collins, CO only three sleeps before Christmas...). Initially followed Great South Road towards the city, passing an encampment listed with "Gypsy Fair this weekend". A few rolling hills. Overall, Auckland had some gentle hills, though nothing too bad. Past a golf course, I turned left over the railroad tracks and through industrial areas. Several signs indicating "WOF", some sort of automobile inspection. Traffic was moderately heavy but well behaved. Signage used international pictures and otherwise seemed similar to Australia. Followed route 10 first and then 19 and stopped briefly at a shell station. New Zealand seems to have a drink listed as "Energy Drink", presumably similar to a Gatorade. The Black Currant flavor was delicious! I saw multiple cyclists out today including someone from New Zealand post office delivering mail on a bike. The Christmas rush must help her even more with fitness, though she was already slightly faster than I was. Also saw half a dozen bicycle stores and bike signs, so feeling like despite chaotic roads, Auckland is somewhat bicycle friendly. I've already noticed more Indian restaurants than Australia and also more Maori people with a bit more Polynesian sense. Overall 15% of New Zealand is Maori, with larger concentrations on the North Island. At 39 km the motorway stopped and my surface route joined. There are two main routes northwards from Auckland. Highway 1 is the main route and highway 16 through Helensville is the alternate and supposedly quieter road. Lonely Planet Cycling New Zealand recommended route 16, though newspapers warned it would be busy as city folks headed north to Bay of Islands and other tourist areas for the holidays. It was busy, though again traffic was polite. There was a reasonable one meter shoulder though this disappeared when passing lanes appeared. A few small hills to climb and it was also getting warmer. Small town of Kumea had a few shops. I slowed but didn't see anything interesting so continued on to Helensville at 69 km. The last 15 km or so were flatter than before. However I was told the next section to Wellsford would be considerably steeper and I wasn't in a big rush to put on kilometers. Helensville had small tourist information center with helpful person who pointed me to the hostel in town. It was a nice hostel that had originally been a maternity hospital, so a row of separate rooms. Walked around back through town which was well open for a Saturday afternoon. Relaxed and read and updated the web page on my laptop. 69 km today, 24850 km cumulative. Today was a hilly ride, though not as bad as I'd expected. I rode to the start of the Lonely Planet "Northland Circuit". Lonely Planet suggests that cyclists take bus to this point to avoid traffic and hills, so I was prepared. I'm slowly adjusting to the time, but still left Helensville early. The road followed a river and wound around and through a few small hills for the first 11 km to Kaukapakapa. Pastures and farmland along the way as well as the Vegetable stand shown above left. This was nice small settlement with hotel and few shops still closed on a Sunday morning. It seems that the standard morning greeting is again "Good Morning" instead of "G'Day". 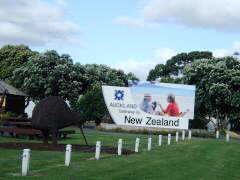 At 59 km came into Wellsford where route 16 meets the main highway 1 from Auckland. Got both a better shoulder and more traffic here. A number of cars towing caravans, boats and other items for a holiday weekend up north. The hills also damped themselves out slightly here. Had a few overtaking lanes where the shoulder narrowed and cars decided to race past. I stopped for an early lunch and reading the paper at Wellsford. From Wellsford it was a bit warmer as I climbed over a few more hills. At 78 km was Kaiwaka with a nice Dutch Cheese shop. I bought 100g of marzipan here to have for Christmas and spoke (in Dutch) with the proprietor who had moved to New Zealand some 20 years ago. From Kaiwaka it was 8 km and a few more hills left for the day. Still heavy traffic and also had my first beer bottle thrown at me. Sigh... Make it all the way across the US and around Australia with verbal abuse at worst and to now have this New Zealander bozo pulling such a stupid and dangerous stunt. Fortunately it missed and shattered beside my wheel, but didn't leave a good kiwi impression. Up the last hill was Brynderwyn which consisted of a tea room, petrol station and a motel. From here a 7-day, ~500 km loop is mapped by Lonely Planet as their Northland circuit and ending at Whangarei. 87 km today, 24937 km cumulative. A pretty ride through rolling hills to start and flat plains to finish. Light rain and drizzle with NW winds as a front came through. Overall not too difficult as I took "day 1" of the Lonely Planet route. My ride started downhill from Brynderwyn in light rain. Green fields with sheep and cattle along the way. A few rolling hills, though nothing too bad. Met several dairy trucks coming the other way and otherwise light traffic. At 7 km was small town of Maungaturoto and at 20 km was Paparoa with a fair sized hill preceding. At 26 km, I saw signs for the Kauri Museum, one km away. This area used to be covered with large Kauri trees. Early settlers logged these trees and also harvested the gum sap from the trees. The museum had well done displays about the wood industry and early pioneers. I was impressed by a butter churn that could prepare 5600 pounds at a time as well as beautiful Kauri woods. From the Kauri Museum one more large hill before I came into flat plains. My speed was still slow as the NW wind picked up across the plains. At 43 km was little town of Ruawai. Stopped here to mail off computer disks and get some snacks. In this area were many signs for kumara...some sort of tuber vegetable. The road turned here, though still kept in the wind. At 61 km was Mount Tokatoka pictured above left. Not much longer I came to Dargaville. Dargaville was busy with many shoppers out in the streets on day before Christmas. The hostel was closed for a few days over the holidays, but I found a nice motel room. Decided I'd stay here for a rest day over Christmas rather than riding tomorrow. 72 km today, 25009 km cumulative. I had a quiet Christmas in Dargaville. The weather would have been good for riding, but it was also nice to just take a day off in town. Walked around town, read and otherwise relaxed. The town was otherwise sleepy and quiet. 0 km today, 25009 km cumulative. A wonderful ride today through beautiful terrain with many Kauri trees and ending along the coast. Lonely Planet warned that today (Day 2) would be flat for 28 km and then with large hills. I started early in a crisp morning with almost clear skies. Dargaville looked peaceful and calm along the Wairoa river. Rode along the river for 2 km before turning north again through quiet farming lands. Saw instances of dairy cows walking single file...presumably coming from the barn and heading towards the fields. They were ambling along, but seemed to know exactly where to go. It really was flat for the first 30 km, with just an occasional slight rise and dip. Kaihu had a small Mobil station and cafe where I stopped for a breakfast sandwich to power myself up the 3 km "steep hill" that was supposed to be worst for the route. This started at the pub pictured above right. The hill turned out better than expected, a slow climb but not too steep. At this point the route stayed high along a ridge with magnificent views. A brief dip to Aranga at 40 km and then another 3 km climb. At 48 km I entered Waipoua Forest with many large fern trees. The road descended for 6 km down to the river through dense forest. Beautiful ride with occasional twists and turns in the road. At the river were signs to the Forest Visitor Center. I followed these for 1 km along an unsealed road. The visitor center had nice small display area and small gift shop. This was officially end of "day 2" with campground and cabins nearby. However, my early start meant it was only 11 am, so I decided to ride a bit further. After riding back from visitor center, I had a slow climb for 7 km back through the forest. It was mostly cloudy, but a bit humid. At 63 km I stopped at a trailhead for a hike to "Father of the Forest", the second largest Kauri tree in New Zealand. This was a nice 1.5 km path that gave me a good feel for dense tropical forest. The tree was huge, big and wide though not necessarily tall. I rode along for another km and stopped at a second trailhead for a 300m walk to God of the Forest, the largest Kauri tree. Wow! Came back from my tourist hike and had a cookie and coke at the trailer pictured above right. After this point another slight climb before leaving the Waipoua Forest and coming back to pasture lands. At top of the hill, a steep 6 km descent where I encountered two French cyclists riding uphill. They were in NZ for eight months and on this tour north of Auckland. Seems like most of the tourists I meet are German and French. I'm told many of the cyclists are US and Swedish though haven't met either. At bottom of the hill back in pasture lands with an occasional rolling hill. Headwinds also picked up from the north. The steepest of these hills came at 83 km and was much steeper than the hill from Kaihu. By now it was hot and I was sweating. I was rewarded by beautiful view on top overlooking Hokianga Harbor and Omapere. By now I'd had enough for the day, so found a place to stay. Omapere appears to be popular beach resort, so I was fortunate to still get a room. In evening noticed NSW was back in the news with severe bushfires around Canberra and around some suburbs of Sydney (e.g. Heathcote and Helensburg). Also saw that weather forecasts didn't look too good for next few days. 85 km today, 25094 km cumulative. Squish, squish, squish... a wet ride today. The day started with light rain as I left Omapere. A tractor towing a boat passed me on an uphill and then I followed it for several kms before it turned off at boat ramp in Opononi. Some more rolling hills after that including one above left with several turkeys puffing themselves up and putting on a display. Rawene at 26 km is site of a ferry crossing of the Hokianga Harbor and end of "day 2" of the Lonely Planet ride. The ferry schedule says crossings occur at 6:45, 7:30 and 8:30, so I kept riding along for the 8:30am ferry. Stopped briefly for another e2 energy drink and made it to the ferry at 8:10am with plenty of time to spare. I was surprised to see it leave at 8:15am. On the crossing the rain started coming down much harder. There was a backpacker hostel about 1 km from the ferry, but decided I'd ride in the rain. Nice quiet back road. It was mostly flat. At 30 km was Kohukohu with small pub and few shops. Around 40 km was first larger hill with some rolling terrain as I came to Broadwood at 54 km. Fortunately, the rain subsided as I got closer. Broadwood had a market where stopped before continuing in rain and rolling terrain. Until now winds had been calm, but a north wind started up. Squish, squish, squish went the pedals. The hills seemed a bit more difficult and I even walked one. A little before Hereking at 80 km I saw large pig walking along the road. Hereking was a turn in the road with pub and not much else. From here at 85 km the road climbed through Hereking Chasm and then down again. The road bounced a bit the last 15 km, eventually with smaller hills and more traffic. Came to Kaitaia, population 4800 and was ready to stop for the day. Kaitaia had a busy main street with many shops including an internet cafe. Students on school holidays were busy playing the latest multi-player game on the machines. Found a nice place to stay and worked on drying out from the rain. 100 km today, 25194 km cumulative. One of those days when I felt a bit more tired. A sequence of short sharp hills didn't help. None of them particularly long, but just steep enough to slow everything down. Made a shorter day, riding only the distance for "day 5" from the Lonely Planet guide. A brief shower came just before I left, but nice to see it dry as I departed. Flat cycling for 8 km to Awanui where there was a nice bakery. Quite a few of the places here advertise Cape Reigna tours. Cape Reigna is the tip where Tasman Sea and Pacific Ocean split and almost the northernmost point of the North Island (Northernmost point is Kerr Point some 30 km further east). Some nice beaches and a lighthouse, but the guidebooks didn't make it sound interesting enough for a 100 km up and 100 km back journey. After Awanui the hills started, with a brief climb up at 10km and then a descent not much later. Beautiful scenery though a bit wearing to roll over the hills. A nice tailwind also helped. The route went through mostly farmland and vacation properties until I came to Taipa at 31 km. Here was another nice bakery where I stopped for a breakfast. The bakery was quiet as I was the only customer. Just then a large "Adventure Tours" bus stopped and it was amazing to see the transformation into a busy crowded shop. Left Taipa on a one lane bridge. These are marked with one direction having priority (white arrow) and other yielding (red arrow). I can't quite figure out the algorithm since it isn't always the same direction, it doesn't alternate and the hills on either side also vary. Taipa was first of several beach towns: Taipa, Cable Beach and Mangonui. Pretty little towns where one could rent a cottage and spend a holiday along the beach. However now they mostly had "No Vacancy" signs out. Several more short sharp little hills to keep in practice here. After Mangonui, left the coast and through more rural areas again. A few more gradual hills and then down through Kahoe to Whangaroa Bay where it became flatter. At 68 km I went over one more one lane bridge to come to T intersection where I went left to Whangaroa and from there about 5 km further. As I rode past the bay, I could see oyster farms in the main bay. Rode to main dock and then found a motel only to see "No Vacancy" posted. Rode back to the dock and got directions to a hostel a bit further. Fortunate to get one of the last rooms (they've already booked up for tomorrow... so I'll need to watch tomorrow as well). 74 km today, 25268 km cumulative. A shorter ride to the touristy Bay of Islands region. Today I followed "Day 6" of the Lonely Planet route. The hostel was nice last night and gave me a chance to send some web page updates. I was back on the road early under clear skies. The first six km retraced my route back to the main road. Just past the intersection was Janit's Texas Diner and Wild West Mini-Golf. The road was mostly flat through Keou at 9 km and then climbed shortly thereafter for almost 6 km. I'd raised my seat slightly which felt better in climbing though it was still some work. Got some nice views from the top and for a while along a ridge before descending into an area with many signs for fruit and vegetables: oranges (spray-free), macadamia nuts, sweet corn, tomatoes, potatoes, ... Stopped briefly at Kahoe where the gas station had a Lord of the Rings promotion. This trilogy of Tolkien's books was recently filmed in New Zealand. Auckland even officially changed its name to Middle Earth for a while. After Kahoe, came to a road junction at 43 km to Bay of Islands. For the last 13 km I could tell I was approaching a touristy area. Came past a sign listed as "Zorb". This was a giant clear hamster-ball wherein a person would climb and allow themselves to be rolled down a hill. A little further was the tandem sky dive. All along I saw the "No Vacancy" signs as I passed more motels and campgrounds. There were a few rolling hills and came down the last one. It was only 11am, but decided to be safe and look for place in Paihia. This is peak tourist season when the area goes from 3,500 people to over 40,000. Paihia is in middle of Bay of Islands tourist area with many activities (beyond skydiving and zorbing also boat cruises, fishing, concerts, diving, beaches...) and many small shops, places to eat and places to stay. Also just north of here is Waitangi National Reserve and important historical site for New Zealand. The Bay of Islands was center of settlement of both Polynesian Maori as well as Europeans. In 1840 the Treaty of Waitangi was signed between many Maori chiefs and representatives of the British crown. The chiefs ceded governorship to the British Queen and the British guaranteed them possession of lands, forests, fisheries and other properties. Later in 1840, William Hobson became the first British Governor of New Zealand. The reserve had the historic house where treaty was drafted as well as several memorials to the signing. One pictured above left is a giant war canoe in separate building. Also here is Maori meeting house and restored treaty house. Spent afternoon looking around the Waitangi National Reserve and also walking a bit around Paihia. Interesting atmosphere as everything is full. They've even opened a sport field with signs saying "Beach Camp" is now open...cars and tents are populating the field. 56 km today, 25324 km cumulative. A short ride again through hilly terrain. Came to Whangarei, population 45,000 and largest town in Northland. Unlike the busy party scene at Bay of Islands, very quiet on a Sunday afternoon. The hostel was completely full and booked through January 1st. Several tents parked next to the beach and some people in sleeping bags without tents. All the motels with "No Vacancy" signs but otherwise quiet early morning. In the first 12 km there were four short sharp hills, so hill climbing started early. Stopped briefly at the dump and then again at Kawakawa junction at 17 km. Just prior to the junction two farmers were herding their cows along the road and then across the street. A carload of tourists were taking their pictures besides an arch for the junction. From here the road went back through rural areas and over a small hill. At 20 km was large sign, "Glow Worm Caves 1 km". Seemed intriguing enough so I rode on the unsealed road to the caves. First tour was 8:30 am, so I relaxed and had bite to eat while I waited. Had my own personal tour. The caves were discovered by an Maori woman sheltering from weather. It has been kept in same family and is now in the 13th generation. Nice ribbon curtains, stalagmites and stalactites. The star attraction are these small 1 cm long glow worms. They have a phosphorescent rear end and spin little webs to catch little insects. They seem to spread themselves from other glow worms. When lights are turned out a beautiful display of little points of light... a milky way. Also here was an eel (named Lisa Marie), a cricket and a spider. It was a fun tour. I rode along the main road and over a few more hills. A touring cyclist passed me on one hill, but was gone too fast before I found out where. At 40 km was Hukerenui. Just prior to this I noticed my rear cassette was behaving strange, rubbing and making some noise. Uh, oh... I stopped at the Hukernenui tavern (still closed until noon) and took off all my gear and took out the rear wheel. It looked like the gears might be slipping off the cassette, though the lock ring was still tight. Perhaps water from recent rains? Wasn't quite certain, so pushed on gears slightly and repacked all on the bike. Things rode more smoothly from here, so perhaps I could check at bike shop in Whangarei? Hard to tell what I'm hearing, so hoping for not much. Rode the last 30 km carefully. Traffic on highway #1 was still busy. So far NZ has had 16 fatalities (one cyclist) over the holidays. For a country of 3.7 million people, this seems surprisingly high. Whangarei was big town, though all the motels had "Vacancy" signs. Stopped here to find a bike shop (and not be on roads in late afternoon when folks are rushing for the night). There were four bike shops in town. Two were closed until January 3rd, one didn't post hours and the last would be open at 9 am on the 31st if I wanted to wait... Decided I'd chance it for now and if necessary could always come back to Whangarei. Still not certain how real or imagined the issue is. Otherwise walked around downtown through mostly closed shops. Overall this was "day 7" and last day of the Lonely Planet ride. 75 km today, 25399 km cumulative. Today was a nice ride through some beautiful scenery. Quite a few contrasts along the way. Completed the loop back to Wellsford where I'd passed through on December 23rd. The cassette made some noise, but this could also just be dirt from the past storm. Whangarei was quiet as I rode through middle of the city and back up along a gentle hill out of town. At 5 km I stopped for breakfast at a petrol station and was quickly rolling again. There were some gentle hills to ride but after 15 km it became surprisingly flat. Wow! Nice to have flat terrain again. Farmlands along the way. The road was becoming busier as I was riding the main highway #1 again. However, making good progress. 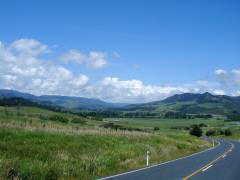 At 40 km I left the main road and followed signs for Waipu. Waipu was settled by Scottish settlers who first went to Nova Scotia before sailing to New Zealand. It was a bustling little town with the annual Highland Games set for tomorrow. Above left shows a carnival ride being set up. I took a break to walk the town, get a snack, check the internet and otherwise look around. After a nice break, hopped back on the bike for Waipu Beach at 48 km. From here the road had short sharp hills again as I went along the shore. A hiking trail led to Brynderwyn. Otherwise nice coastal scenery as I came through town of Langs Beach at 56 km. After Langs Beach some more rolling hills and also a bit more wind as I came over the hills and down to Mangawhai at 69 km. Mangawhai was also quite busy. Stopped and talked with the tourist bureau... the area is 1 1/2 hours north of Auckland and hence site for many vacation homes. Everything is very busy as people have come up to celebrate the New Year along the beach. The person at tourist bureau was kind enough to call Wellsford and make a reservation for me. She also apologized that scenery until then wouldn't be too exciting. Despite the tourist bureau, I found the scenery quite lovely. The road slowly climbed along a ridge and through more farming areas. Beautiful views out over the fields. At 91 km I came to road junction back with now very busy Highway #1. Seemed like everyone was rushing to get somewhere for the evening. At 95 km came to Wellsford and was tired enough to stop for the day. I had a place in the Wellsford Inn, a nice old hotel in middle of town. I must be one of few guests and they didn't seem particularly well set up to get other guests. Traffic still rushing by outside, but otherwise a quiet New Year. Walked up and down the main street. Also mended seams in my bike shorts that seem to have come undone. I replaced my tennis shoes the other day. Slowly been wearing through some of these things. 95 km today, 25394 km cumulative.